Hearts are one of the more popular tattoo designs. At one time, "Mom" heart tattoos were typically worn by sailors. The symbol expressed a sailor's love for his mother while he faced the possibility of not returning home. Today, people from all walks of life embrace heart tattoos. Anyone of legal age can have a permanent piece of art inked on their body. 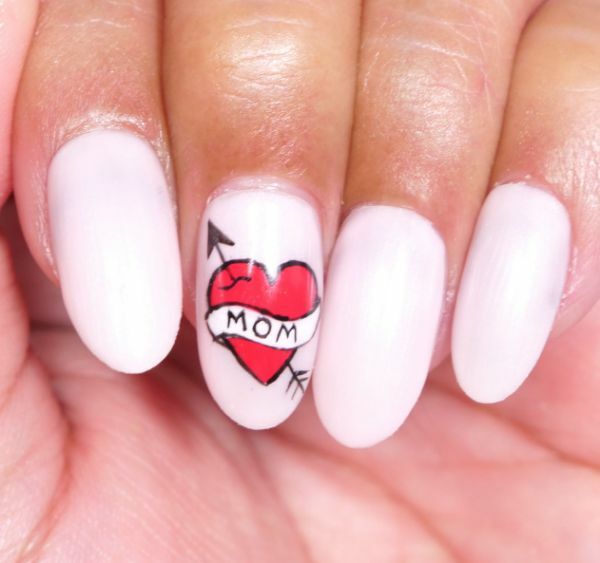 However, if you aren't up for such a commitment, you have an alternative —mom heart tattoo nails. 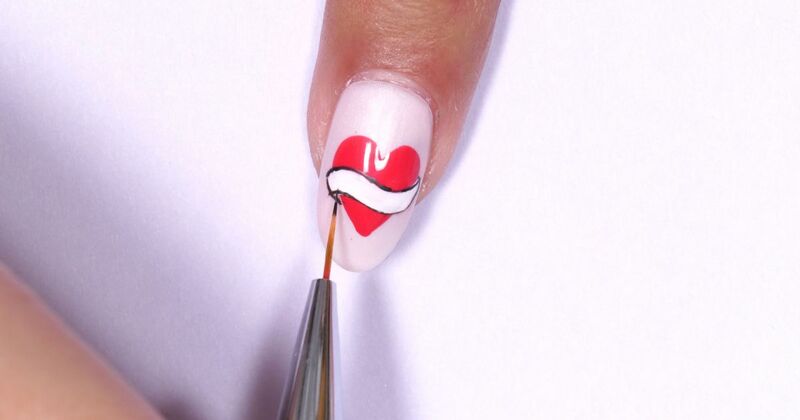 Paint a Mom-heart tattoo on a choice accent nail. If the heart fades over time, simply remove it and paint your nails another color. 1. Paint nails with Mission Control Fizz gel nail paint. Allow the white paint to dry. 2. Dip a dotting tool in Mission Control Power Up. Create two red dots in the center of the nail. Blend the red paint with the dotting tool, but leave an arch at the top of the circles. This arch will serve as the top of a heart. 3. Drag the the red paint downward with a fine detail brush to create the bottom of the heart. Allow the paint to dry. 4. Dip another fine detail brush in Mission Control Fizz. 5. Draw a wavy line across the center of the heart. The line will serve as a banner — make it thick enough to write the word "Mom" on it in a later step. Allow the white paint to dry. 6. Dip a fine detail brush in Mission Control Overdrive. 7. Outline the white banner with the black paint. 8. Draw a small, wavy black line on one of the red arches at the top of the heart. This wavy line will serve as the puncture mark from an arrow. 9. Draw the top of an arrow pointing upward, exiting the arch at the top of the heart. 10. Move the fine detail brush to the opposite side of the heart, then position it at the bottom. Draw the bottom of the arrow, featuring two triangular shapes branching from the arrow's shaft. Allow the paint to dry. 11. Write the word "Mom" in the center of the white banner with a fine detail brush. Use black paint, as it will show up bold on the white banner. Allow the paint to dry. 12. Outline the red heart with black paint. Carefully trace the heart with the fine detail brush. 13. Follow steps 1 to 12 to create a mom heart tattoo on the opposite hand. 14. Allow paint to dry, and add a clear top coat if desired.